The Limited is turning 50! The Limited is celebrating 50 years of leadership in specialty retailing by kicking off a multi-month campaign to reinforce its mission to support clients’ personal success. Founded in 1963, The Limited changed the way women shop for apparel and helped fuel the growth of malls across the country by bringing runway-inspired fashions from New York, Europe and beyond to women everywhere. The Limited remains one of the most iconic brands in specialty retailing today. In celebration of its Golden Anniversary, the brand is launching a multi-faceted campaign focused on helping women succeed. 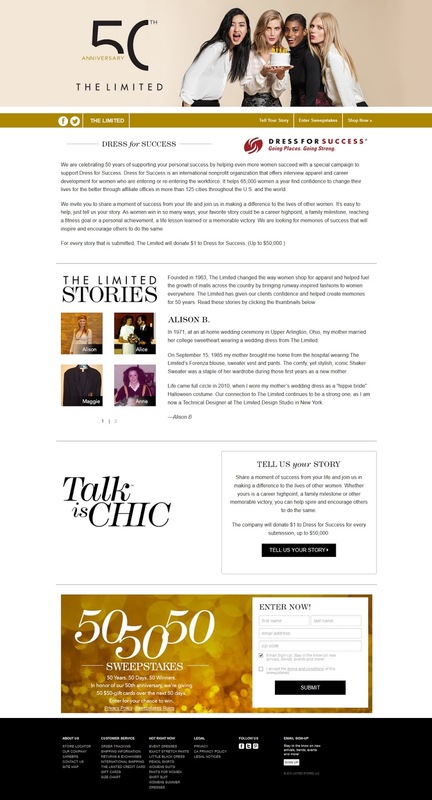 To raise funds for this amazing organization, The Limited is inviting women to share their success stories/life lessons (both personal and professional) online at www.thelimited.com/50th. The company will donate $1 to Dress for Success for every submission, up to $50,000. Additionally, The Limited is donating to Dress for Success 30% of the proceeds from a limited edition clutch purse and a commemorative bracelet that will debut this fall. As part of the 50th Anniversary festivities, The Limited will also launch a social media campaign this August that will allow consumers to select the ultimate celebration dress design they would like to see in stores as well as where the culminating birthday celebration will take place. The company’s associates will cap off the celebration in October with a simultaneous commemorative event across all 259 stores nationwide. So make sure to help The Limited celebrate their 50th anniversary by visiting a store near you or getting involved with their campaign!